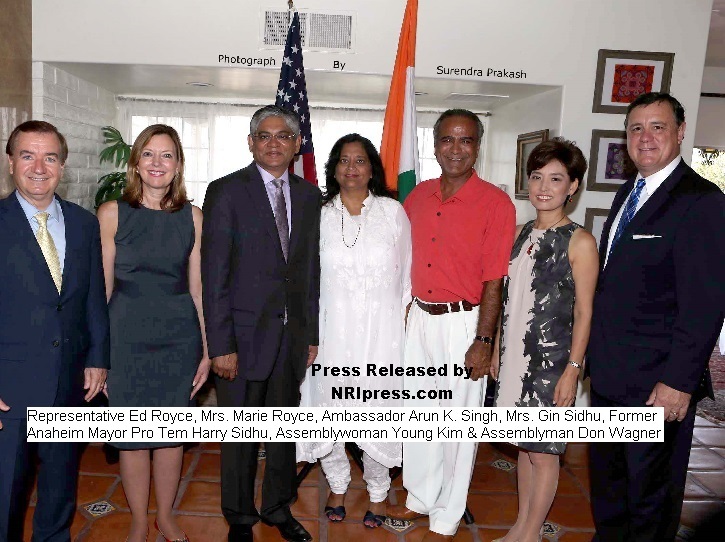 Former Anaheim Mayor Pro Tem Harry Sidhu and his wife Gin Sidhu hosted a very special India Independence Day Event honoring Ambassador Arun K. Singh and U.S. Representative Ed Royce (serving California’s 39th Congressional District), on Sunday, August 23, 2015, at their home in Anaheim, California. Among the nearly 200 attending the celebratory occasion were prominent members of the Southern California Indian American community, Mrs. Marie Royce, Deputy Consul General Dr. K. J. Srinivasa from the San Francisco Consulate, and the following well-respected civic leaders: 68th District State Assemblyman Don Wagner (accompanied by his wife Megan) - who gave the Invocation; 65th District State Assemblywoman Young Kim - who led the gathering in the U.S. Flag Salute; Orange County 1st Dist. Supervisor Andrew Do, accompanied by his wife, Hon. Cheri Pham (Judge, Orange County Superior Court); and Shawn Steel, Former Chairman of the California Republican Party, and Republican National Committeeman. The Anaheim Police Department Color Guard (comprised of Explorers Matthew Bevins, Mario Sanchez, Noah Agosta, and Shane Ryan, under the direction of Officer Leslie Vargas) led the “Presentation of the Colors” (U.S. & California State Flags), joined on stage by Lt. Commander Pooja Shah, U.S Navy. Immediately thereafter, the following “Retired Indian Veterans” entered for the India Flag Hosting: Col. T.J. Barring; Col. R.S. Sohi; Col. Pannu; and Col. Jagdeep Singh. Erika Miller, of The Chance Theater, Anaheim, performed the U.S. National Anthem, and members of the Pande Family sang the National Anthem of India. Addressing those in attendance, Ambassador Singh highlighted the important, consolidated relationship India has with the United States, underscoring economic opportunities and reflecting upon the potential regarding collaborative partnerships of innovation. He expressed his personal thanks to Former Anaheim Mayor Pro Tem Harry Sidhu and his wife Gin Sidhu for hosting such a wonderful cultural event. Representative Royce, Chair of the House Foreign Affairs Committee, has been instrumental in strengthening relations between the U.S. and India, especially in developing business partnership and trade goals. 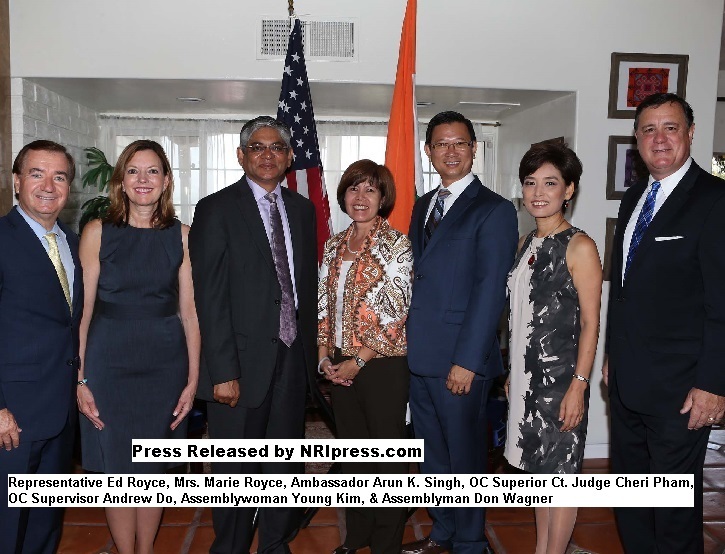 He specifically commended the Southern California Indian American community for their achievements and ongoing endeavors in building a closer India-U.S. partnership through talent and determination. Mrs. Marie Royce spoke of her meaningful visits to India, as well. 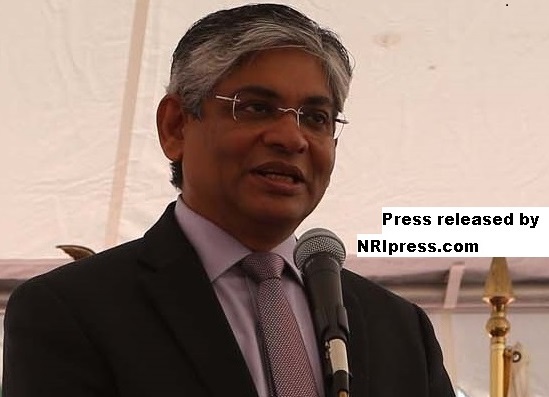 Deputy Consul General Dr. K. J. Srinivasa stated how pleased he was to be joining Ambassador Singh and Representative Royce at the event, emphasizing the importance of promoting Indo-US relations and exploring opportunities for positive momentum. Shawn Steel provided motivating remarks, also conveying best wishes on behalf of his wife, Orange County 2nd Dist. Supervisor Michelle Steel. Additionally, Indian American Republicans of California (IARCA) Statewide Co-Chairs Dilip Butani (also serving as Pres., Federation of Indian American Assns. So. Cal.) and Amrit Bhandari offered historical perspectives for the occasion. And, specific recognition was given to distinguished community leader KV Kumar, for his significant event organizational support and assistance. Apra Bhandari, Founder and Artistic Director of Adaa Dance Academy, served as the event emcee. Cultural entertainment was provided by prominent vocalist and stage performer, Nauzad Sadry, with dance numbers by the award-winning Adaa Dance Academy students. A unique demonstration of the powers of “awakened Third Eye” was also presented by children under the guidance of Ma Viroopa, Vice Chancellor, Nithyananda University - promoting and creating awareness of the upliftment of humanity. Surendra Prakash served as the designated event photographer .photomagicroom. net; sudhaphoto.com. Former Anaheim Mayor Pro Tem Harry Sidhu concluded the occasion by thanking everyone for attending in celebration of liberty, freedom, and cultural understanding. He gave his great appreciation to all who made the event possible, especially his wife Gin for coordinating the festivities, and the many dedicated friends and volunteers for all of their efforts.